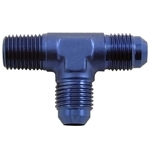 AllStar 1/8" NPT to -3 Fitting. Straight. Steel. 2 Pack. Aluminum 1/8" NPT to -3 Tee on Run. Fitting.